Adobe Campaign is well suited for enterprise-level marketing communications. It can manage and deploy large volumes of emails very efficiently. Workflows can allow multiple touches, staggered sends, and segmentation to occur all within one delivery if needed. Interactions and reporting can happen in real time or near real time if needed. When integrated with the rest of the Marketing Cloud, Campaign becomes even more powerful as platforms like Analytics and AEM can have functionality brought directly into Campaign for more effective content creation and reporting. If you are sending some fairly basic, simply designed emails, Eloqua is perfect for you! It shares an easy tracking system and basic metrics after each campaign is sent out, and you can schedule emails in advance and specify details about how they are sent. While the templates are fairly standard, they are easy to update and work with, and if you don't have very intricate designs you're using, they will work just fine. The emails are mobile friendly and send quickly, and overall the system is simple to use and understand. There are options for enhanced functionality, A/B testing, and more for those who want to go deep into their email campaigns, but it's also a great system for simply sending out communications and tracking them, particularly if you send a lot of emails and just want a standard format to go out whenever you need it. Flexible. If you have a developer, you can build many custom experiences. Integration with other Adobe products. Having used several platforms, I have found that Eloqua is a great tool for Marketers. It really shines in a B2B environment where e-commerce is not the goal, but controlled communication is the main goal. Eloqua's Campaign canvas is extremely powerful yet easy for mildly skilled marketing teams to use and create complex engagement tracks. As robust and helpful Campaign is, some aspects of the UX could be improved to be better streamlined. Eloqua can feel like a loosely connected tool until you gain experience. No wizards or controlled step through setups are offered beyond simple sends. Eloqua has powerful reporting and metrics but takes a skilled individual to extract and massage this data into logical and understandable results. Front-end development tools are very simplistic. It is still best to build all of your email and landing pages in HTML and connect to Eloqua. Despite the shortcomings of user interface and basic troubleshooting difficulty, Neolane is much more robust and delivers better capabilities to our sales and marketing staffs than any other product we have used here or any product our staff members have used at other locations. We have been able to automate so many marketing processes with Eloqua over the past 5 years that the only direction would be to adopt the latest and greatest features Eloqua adds. The alternative would be to go back to the marketing stone-age and start over again. And we would rather move forward with increased automation and efficiency. It can be difficult to use and to train non-technical users, but the functionality overall is great. 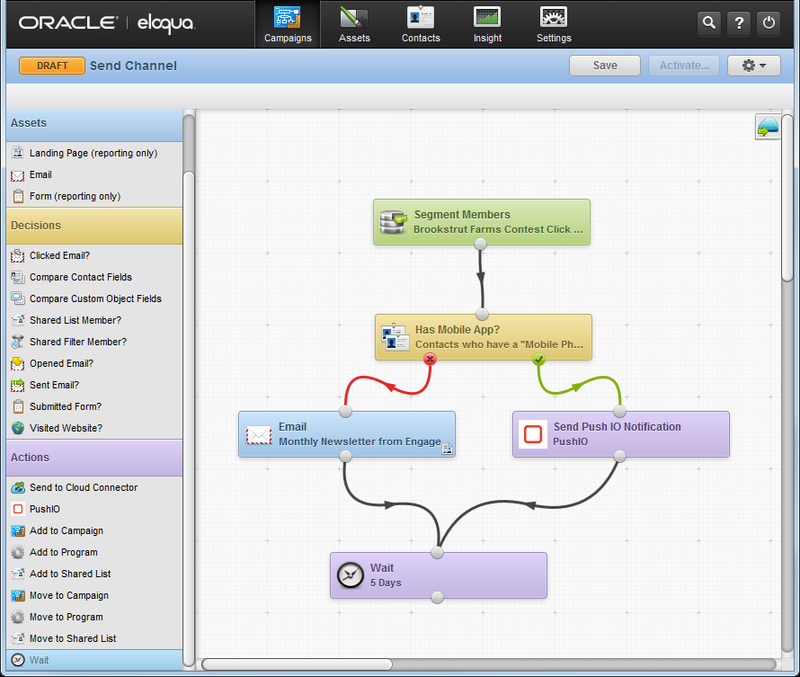 Oracle's Eloqua is a powerful program but it does have a steep learning curve for someone who has not used it before. Eloqua University is very intersting, with a thorough programme and very experienced trainers. The Master programme is great! The implementation of Eloqua is not a problem if data are correct and if the overall process between Eloqua and the CRM are well taken into account. I have no insight into alternative products. I see some overlap in capability with OBIEE, but the overall value prop is different & would not consider them to be competing products. We only provide support for our clients, so I cannot share hard numbers, but we do notice our clients getting much more leads of better quality out of their marketing efforts. By aligning Eloqua CRM integration with business flows, we see our clients are learning how to qualify leads and how to follow up on them. At the same time, using Eloqua allows them to close the loop on marketing efforts, which gives marketeers the ability to validate their budgets. Leverage simple, but powerful canvas to orchestrate interactions across email, mobile SMS, push and display advertising.